The second season of Project Runway Junior premieres on Lifetime, Thursday, December 22, 2016 at 10:00pm ET/PT. Tim Gunn and supermodel Hannah Jeter host the junior fashion design competition. Kelly Osbourne, Christian Siriano, and Aya Kanai are returning to judge the 13 to 17 year old contestants. Olivia Holt has joined Project Runway Junior, season two, as the season finale guest judge. Get the skinny from Lifetime, after the jump. LOS ANGELES, CA (November 17, 2016) – Move over millennials! Make way for Generation Z with the second season premiere of Project Runway Junior, returning on Thursday, December 22nd at 10pm ET/PT. Emmy® Award winner Tim Gunn and fellow co-host, supermodel Hannah Jeter, are once again joined by returning judges; fashion designers Kelly Osbourne and Christian Siriano and Seventeen Magazine and Cosmopolitan Executive Fashion Editor, Aya Kanai to find the freshest force to be reckoned with in the fashion world. Ages 13 to 17, these Project Runway Junior designers prove amazing talent develops at a young age. Disney Channel actress and singer Olivia Holt (Kickin’ It) joins the judges for the finale to help select the winner. The series moves to its regular time slot of 9pm ET/PT, beginning December 29. The winner of Project Runway Junior will receive a full scholarship to the prestigious FIDM in California; a complete home sewing and crafting studio, plus, the dream machine, all courtesy of Brother; a feature in Seventeen Magazine; and a $25,000 cash prize, to help launch their line. Also, butter LONDON will supply a year’s worth of products and the opportunity to consult with butter LONDON to create a limited edition nail color collection. The styles from their finale collection will be manufactured by Los Angeles Development House, Lefty Production Company. What do you think? 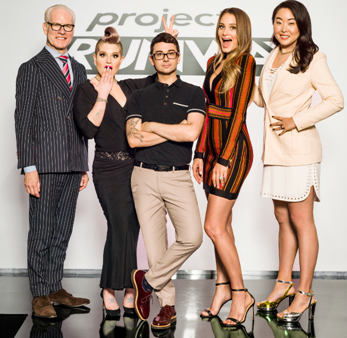 Did you watch the first season of the Project Runway Junior TV series? Do you think you’ll check out season two on Lifetime? Let us know, below.